Coolest Kids Birthday Cake Ideas are when you think as a child. Remember to look through the eyes of a child and you can come up with the coolest birthday cake ideas. Your birthday cake theme should follow your party theme. And of course you will choose your child's favorite flavor, whether is is chocolate cake or peppermint ice cream. But you don’t have to buy and expensive cake or spend hours decorating it perfectly – let the kids decorate it! Doodle Cake - Bake your kids favorite flavor cake and ice with white frosting. Buy cake decoration in tubes or edible marker pens, and let them doodle and decorate the cake. M&M Birthday Cupcakes - Those colorful candies make great cake decorations. Make cupcakes and give each kid their own cupcake to ice and decorate with M&Ms. You can also order customized M&M candies online to use as cake decorations and party favors. Nature Cake - Decorate a cake with edible fruits, flowers, nuts or herbs, such as blueberries, nasturtium flowers, sunflower seeds or mint leaves. 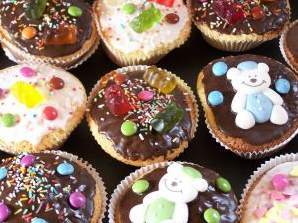 This makes a healthy way for kids to decorate birthday cupcakes. Pigs Trough - Another friend gave the teenage boys a large Farrells style “pigs trough” full of ice cream, cupcakes, bananas and toppings in a huge bucket. They still talk about it as one of the coolest birthday cake ideas ever. Here are some idea on how to make themed birthday cakes for kids. Baseball, Basketball or Football Cake - Use orange and brown Reese's Pieces candies to decorate a cake to look like a basketball or football. Or buy custom white M&Ms and make a baseball or softball cake. Snake Cake - Make a bundt cake and cut in half. Assemble in a S shape and decorate with icing. Small candies or chocolate can form the stripes. Toy Cake - Small toys can make great decorations for themed birthday cakes, such as rubber duckys, toy cars, My Little Pony, Sesame Street characters or superhero figures. Choose an icing color to compliment the theme and top with your decorations. Sprinkles add a nice flair for these themed birthday cakes. Train or Tractor Cake - Use colored frosting and chocolate bars to decorate a cake for boys shaped like a tractor or train. - You can also take a photo to a local bakery and ask them to make an edible image. Your image can be a photo of your kids or their favorite character. If you prefer to bake your own cake, ask if you can just buy the edible icing photo and you can put in on your homemade cake. Ice Cream Cakes - If your kid loves ice cream, why not choose an ice cream birthday cake from Cold Stone Creamery, Baskin-Robbins or your local ice cream store. You can go online and see some great kids birthday cake ideas. Bundt Cakes - Some stores such as Nothing Bundt Cakes offer adorable bundt cakes for an alternative. I also like to make bundt cakes as home too, as they are easier to make as healthy cakes with less sugary icing. 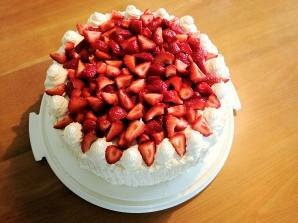 - Costco stores offer inexpensive cakes that can be pre-ordered for your party, or picked up at the last minute.